At its core, The Longing of the Dervish tells the story of two enslaved lovers — a Sudanese man and a Greek woman — who are thrown together and torn apart by the first victories of the 1881 Mahdi uprising. The Mahdist uprising began after cleric Muhammad Ahmad proclaimed himself Mahdi, or the promised redeemer, and led an assault on the Egyptian administration in the Sudan. This later grew into a battle between the Mahdists and British colonial forces. Ziada (@Hammour_Ziada), born in Umm Durman, Sudan in 1977, studied computer science, but worked as a human rights researcher and a journalist before moving to Cairo in 2009. 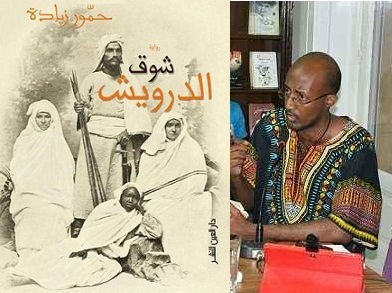 The Longing of the Dervish is his second novel, and he has also published two previous short-story collections and has been an active blogger who was involved in protests against Sudanese President Omar al-Bashir. This year’s Mahfouz Medal judging committee was made up of writers, translators, and academics: Tahia Abdel Nasser, Shereen Abouelnaga, Mona Tolba, Humphrey Davies, and Rasheed El-Enany. The award, announced each year on Mahfouz’s birthday, was first given in 1996. Previous winners include celebrated authors from across the region, including Egyptian Yusuf Idris, Moroccan Bensalem Himmich, Lebanese Hoda Barakat, Palestinian Mourid Barghouti, and Syrian Khaled Khalifa, who won last year’s prize.